In the past couple of weeks the girls have become completely obsessed with books. All the time it is “book! book! book!” (unless there’s a dog around, of course, in which case it is “dog! a dog! woof woof! woof!”). They’re bringing books to anyone who can read and having us read them 53 times in a row. It is awesome. We had more bookish fun this week when I put the girls in their Thing 1 and Thing 2 shirts. 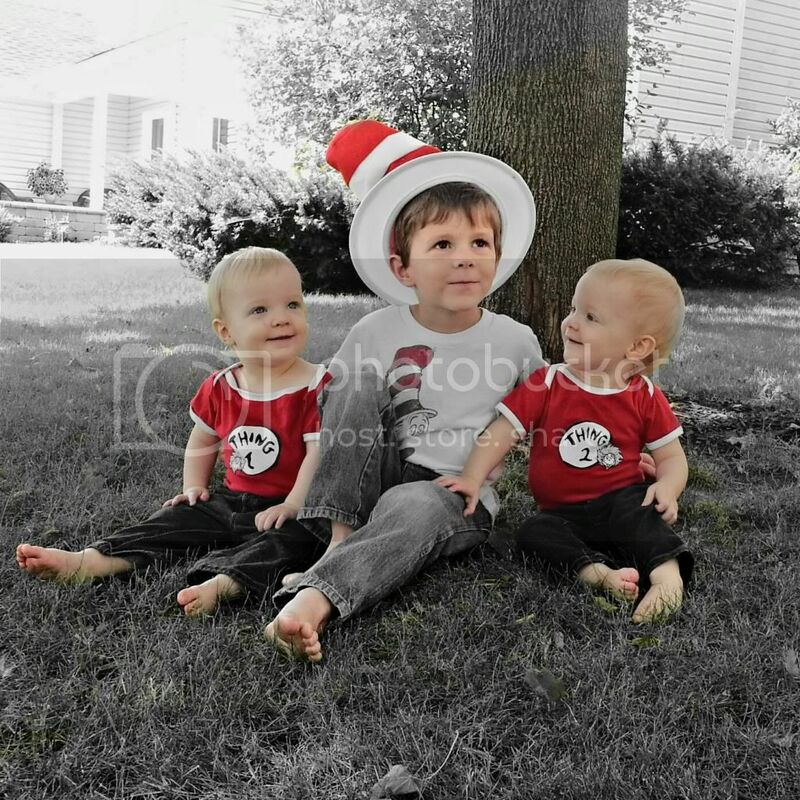 On a whim I decided to change Daniel into one of his Cat in the Hat shirts and his Cat in the Hat hat and take them all outside to take a picture. The result was probably the most popular picture I ever posted on social media, other than perhaps when the girls were born (although maybe not even that). Thanks for the books (and the picture), Little, Brown! So, I know the month is half over and I was supposed to tell you about this weeks ago, but Bloggers Recommend is giving away a total of FIFTY copies of Donna Tartt’s newest book, The Goldfinch. Tartt’s A Secret History is widely beloved, and The Goldfinch promises to be one of the hottest books this fall. It comes out in October, but YOU, my friends, YOU can read it early. We’re giving away a copy a day for the rest of the month from Bloggers Recommend (enter here), and I have another three copies here. Enter both places because, why not? To enter to win a copy of The Goldfinch from me, fill out the form below by 11:59pm Central on Friday, August 23rd. US-only, please. I would also strongly encourage you to subscribe to the Bloggers Recommend newsletter and get the hottest book picks sent to your email inbox once a month. This would be a fabulous Holiday card photo! That photo is the greatest! This book sounds fantastic! I actually haven’t read The Secret History yet but everyone is telling me that I should (and has been telling me that for an incredibly long time, it seems). Now I’m off to subscribe to the email list…. Thanks! Good Heavens, those kiddos couldn’t be anymore adorable if you tried. And hurray for book lovers. When my daughter was about 3 she would announce she was going to her room to “play books”. Next week she starts her first year teaching 6th grade English. So, good things happen to readers. Thanks for hosting the giveaway, I’m so excited for this book.